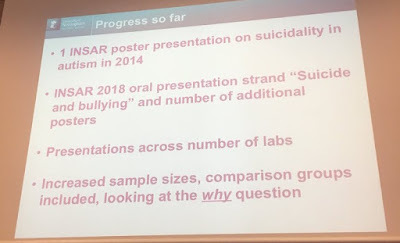 Sarah Cassidy's INSAR 2018 SIG on autism and suicidality brought ~60 autistic people and autism researchers and professionals to discuss research on, and factors underlying and mitigating, suicidality in autistic people—as well as next steps for researchers. The statements and images below are from our original Twitter Moment compilation/report on this SIG. We then heard back that Twitter feeds can be difficult to parse and access for some, so we've created this version as well, edited for readability. Uncredited statements are from the Thinking Person's Guide to Autism Twitter feed. Morning session on suicide and autism starting now at INSAR 2018 - a top priority for Autistica and Mental Health in Autism. At INSAR 2014, Sarah Cassidy was the only poster on suicidality. 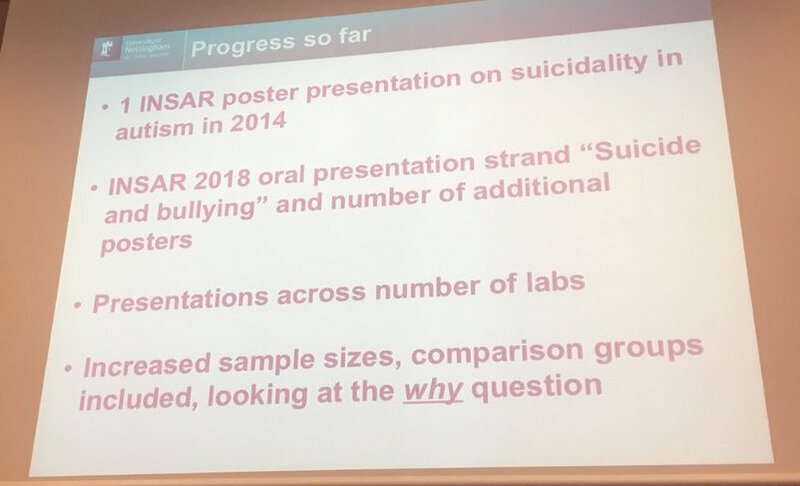 Now there is an entire INSAR 2018 track on autism, suicidality, and bullying. At IMFAR (INSAR) 2016, the SIG goal was to identify priority topic areas. At the 2017, the SIG identified research questions. In 2017, at a summit in the UK, Dr. Cassidy worked on developed theses. Ethics: Does talking about suicide increase risk? Risk/protective factors: Gender, communication, belonging, lack of joy, disclosing, diagnosis, help seeking, sleep difficulties. Treatment/prevention: "we just don’t know what works"
Advances in research on autism and suicide. [image: Side. 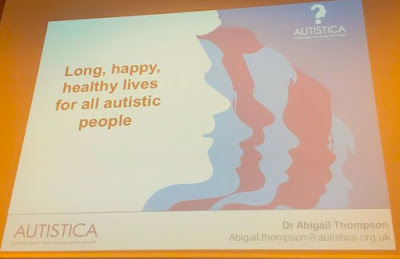 Blue bar at top with white text reading" Progress so far"
Now: Abigail Thompson from Autistica, the UK’s autism research charity, which aims to help autistic people live long healthy happy lives which makes me cry because Autism Speaks and Autism Society: why aren’t your missions this clear and simple? I know I gush about @AutisticaUK a lot, but I’m going to keep gushing about them as long as they keep leading the world in funding research that actually makes a difference in my life. What does belonging mean to #autistic people, and how can it be captured? Sleep difficulties: Important and under-recognized/diagnosed in autism. Also important to define and measure: night awakenings, nightmares? Development of appropriate assessment tools: They have been developed for the general population, but not yet validated for #autistic people. General questions may not be clear or relevant for autistic ppl. Social communication: Over/under reporting of suicidality? Need to consider lived experience in assessment. Help seeking. Increased barrier for support/treatment. One approach Autistica is taking on underfunded but crucial autism areas: Writing accessible reports, and taking them to the agencies who could possibly fund them (in the US and UK). Disclosing diagnosis: “You want the right people to know” Exploring experiences of disclosing, and how and when this may impact suicidality. Risk/protective factors: What keeps people here? …special interests; we need to make sure we aren’t “pathologizing passion”; positive social interaction where desired in the way it is desired. Conceptualization: Phenomenology of suicidality in autism: Quality of life more important than mental health? What does a “good life” look like? In every country in the world, there are more undiagnosed adults than diagnosed. This is a fact. This is a factor. This is a risk. Could religion or other value systems that discourage suicide be a protective factor? Research indicates this is possible. The strength of the autistic community is what keeps many autistic people going, and mitigates feeling like one doesn’t belong— especially when there’s very little support available. Medication: “If our brains are wired differently, then medication must have a different effect upon us.” We need to explore the effectiveness & side effects of meds in autism. How do meds interact with autistic traits? Are antidepressants a risk? And even once we are aware of different effects, how can we train more psychiatrists in this area of specialty? Access to medical providers with knowledge of ASD is limited! Autistica is working with organizations to find out what kinds of mental health services are most helpful. Many autistic people find phones and going to ER/emergency services aversive. Would a text-based chat service be more useful? We think autistic people are more likely to have a short span of time between considering suicide and acting on it (impulse control?). They also tend to choose more final methods, but research is forthcoming. Limited access to methods may help. Gender differences: Autistic females are more at risk of suicide, compared to general population. Why? Masking? Late diagnosis? Differences in communication, suicide planning, methods? Many autistic people are able to realize that being in an extremely aversive in-patient/hospitalized situation is better than being dead — but those shouldn’t be the only options. Need more humanistic, autism-friendly options for those in crisis. Suicidality can be due to needing to "release pressure.” Especially when aware mental health services don’t recognize autistic symptoms/experience. Some autistic people find meds can help with compulsive thoughts that can build to suicidal impulses. Autistic people discussed that stressors associated with being autistic can make life feel joyless. Does this increase suicidality risk? Some commonly prescribed medications for co-occurring conditions (or medication prescribed for “autism”) have known risks not just for elevating suicidal ideation, but possibly causing other physical symptoms (tics etc.) that increase distress. Need to be cautious about making autistic people in mental health crisis join group “mindfulness” efforts that are aversive (e.g., visualizing exercises may be NOT GOOD for synesthetes), increase feeling of not belonging, then blamed for “failing." I am on the aphantasia spectrum. Visualization exercises are really weird experiences for me. How effective are current therapies for suicidality in #autistic people? Can these therapies be adapted? Response and prevention: Important to identify and respond to potentially stressful life events (leaving/changing schools). Would like to know more about suicidality in autistic ppl w/communication disabilities (non-speaking) or intellectual disability/learning disabilities. I wonder, hard, how many written off as “aggressive” or self-injurious are actually suicidal. And everything that has to do with preventing or containing or medicating these behaviors, rather than understanding/mitigating distress factors is making people with profiles similar to my son’s even more miserable. There is no autism-specific drug research on preventing suicidality. As long as the method being looked at isn’t a chemical straitjacket, I’m all for pharmaceutical research on this topic. Yes definitely. I am opposed to chemical straightjackets and for understanding autistic mindsets/motivations; the latter includes appropriate meds, as needed. Protip: 24/7 invasive tracking of everything I do isn’t going to make me less suicidal. I suspect this is true for most autistic people, of all ages. Treat us like we’re human, because we are. It’s true that a mental health crisis might prompt a diagnosis. But also masking prevents diagnosis and masking increases mental health problems so that might change the data in the opposite direction. It is hard to get any reliable autism stats cos we are under identified in my view. Autistic kids (and adults) have a high rate of co-occuring conditions like OCD, anxiety, depression, etc. that can interfere with quality of life and happiness. If they are in distress and medications can help, they should have access to those meds. There is a need for a strategic coordination network for research area in order to enable high quality research and rapid progress. To drive suicidality research forward we need a clear strategy bringing together research in to i) risk/protective factors, ii) intervention/assessment and iii) policy and practice. 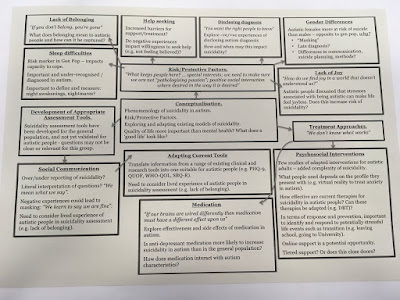 [Image desciption for Autism and Suicidality factors flow chart. What does belonging mean to autistic people and how can it be captured? Autistic females are moe at risk of suicide than males - opposite to general population, why? •Differences in communication, suicide planning, methods? Important to define and measure: night awakenings, nightmares? Autistic People discussed that stressors associated with being autistic can make life feel joyless. Does this increase risk of suicidality? 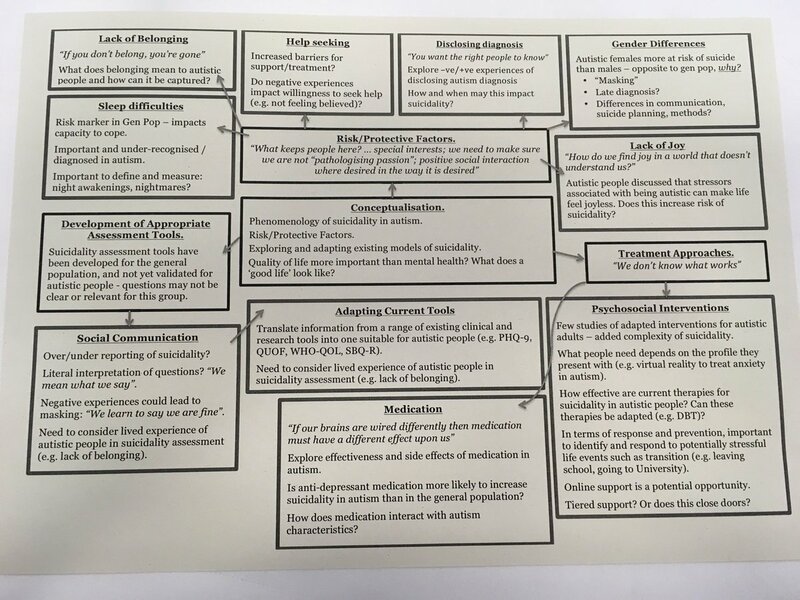 Suicidality assessment tools have been developed for the general population, and not yet validated for autistic people - questions may not be clear or relevant for this group. Quality of Life more important than mental health? What does a “good life” look like. Few studies of adapted interventions for autistic adults - added complexity of suicidality. What people need depends on the profile they present with (e.g., virtual reality to treat anxiety in autism). How effective are current therapies for suicidality in autistic people? Can these therapies be adapted (e.g. DBT)? Tiered support? Or does this close doors? Is anti-depressant medication more likely to increase suicidality in autism than in the general population? How does medication interact with autism characteristics?